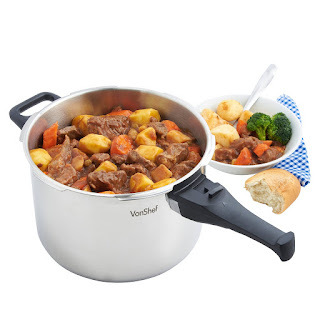 The VonShef Pressure Cooker is an extremely fast and healthy way to cook all kinds of food. Cooking with the VonShef Pressure Cooker your meals will be ready in just 30% of the time compared to conventional cooking methods. Not only does this cut down on preparation time and effort, but also your energy bill at the end of the month as less energy is required to cook! Pressure cookers are also ideal for one pot meals such as soups, stews or casseroles so you can cut down on your washing up too. Pressure cooking is a very healthy cooking method too, because unlike other cooking methods very little of the foods nutrients are lost via water evaporation so your meals remain fresh and nutritious. Due to the very high temperatures inside the cooker there is also a higher chance that any germs or bacteria are destroyed during cooking making it a very safe cooking method. This coupled with the numerous safety features of our pressure cooker help to guard against personal injury, including a mechanically locked lid, pressure safety valve and pressure release switch. 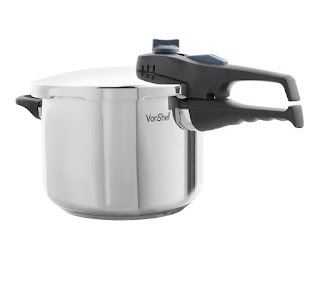 In addition, the VonShef Pressure Cooker is made from stainless steel and not aluminum! Some of the advantages of the stainless steel are as follows: First of all it resists oxidation. Moreover, stainless steel is also durable and it is warp and scratch resistant. The VonShef pressure cooker is not only easy to use, but also easy to clean. With pressure cooking there is no need to worry about over boiling, splattering or spillages onto your kitchen top as everything is safely contained in the cooker! VonShef Stainless Steel Pressure Cooker is amazing! As a busy mom of four getting a home cooked healthy meal on the table takes a lot of time but it's something that I'm committed to. That's why I absolutely love this VonShef Stainless Steel Pressure Cooker. Not only does it cook your food in just thirty percent of the time compared to conventional cooking methods, but it seals in so much flavor! Another great reason to get this VonShef Stainless Steel Pressure Cooker is easy to clean, looks beautiful and will save money on your utility bill since you wont be heating up the house because the pressure cooker also seals in the heat. The VonShef Stainless Steel Pressure Cooker is also very safe and easy to use. I highly recommend everyone own one of these!